After playing with a few HTC Pure SKU urls I came up with AT&Ts prelaunch information page. Check out the information below. Check out the real screenshot here! Go here to order your own real AT&T Tilt 2, you will need to login to AT&T website with your account information. 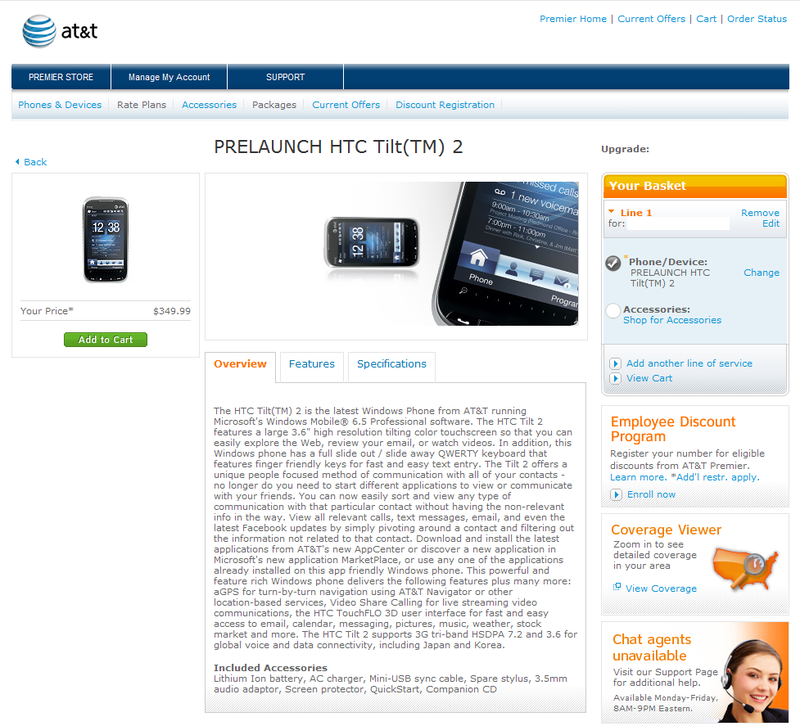 Pricing on this page shows $349.99, although AT&T said it would be $299.99 in a press release today! The HTC Tilt(TM) 2 is the latest Windows Phone from AT&T running Microsoft’s Windows Mobile® 6.5 Professional software. The HTC Tilt 2 features a large 3.6″ high resolution tilting color touchscreen so that you can easily explore the Web, review your email, or watch videos. In addition, this Windows phone has a full slide out / slide away QWERTY keyboard that features finger friendly keys for fast and easy text entry. The Tilt 2 offers a unique people focused method of communication with all of your contacts – no longer do you need to start different applications to view or communicate with your friends. You can now easily sort and view any type of communication with that particular contact without having the non-relevant info in the way. View all relevant calls, text messages, email, and even the latest Facebook updates by simply pivoting around a contact and filtering out the information not related to that contact. Download and install the latest applications from AT&T’s new AppCenter or discover a new application in Microsoft’s new application MarketPlace, or use any one of the applications already installed on this app friendly Windows phone. This powerful and feature rich Windows phone delivers the following features plus many more: aGPS for turn-by-turn navigation using AT&T Navigator or other location-based services, Video Share Calling for live streaming video communications, the HTC TouchFLO 3D user interface for fast and easy access to email, calendar, messaging, pictures, music, weather, stock market and more. The HTC Tilt 2 supports 3G tri-band HSDPA 7.2 and 3.6 for global voice and data connectivity, including Japan and Korea.